Some of the NEMRC programs and reports will allow for documents to be delivered by NEMRC's Document Delivery Service (NDDS). The NDDS removes the known difficulties with managing document delivery via email. The NDDS is a pay per piece service similar to the post office. The billing for the NDDS will be by the month. The NEMRC Document Delivery Service (NDDS) is available in the following places with the list expanding over time. 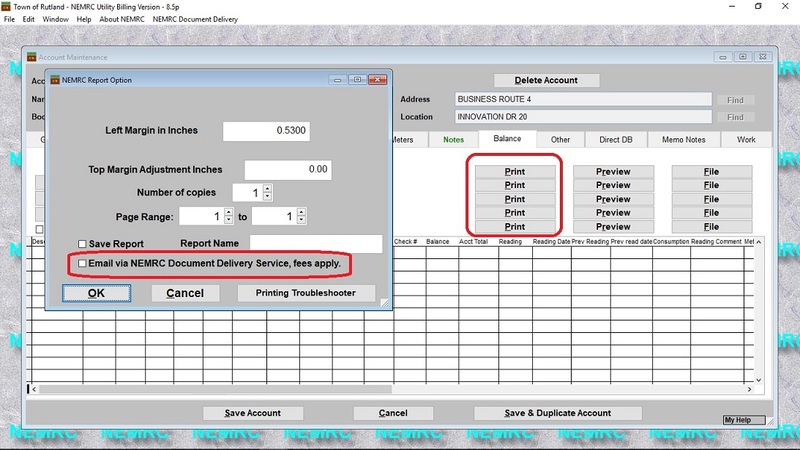 Payroll - Electronic check stubs for paperless delivery. Utility Billing - Paperless bill delivery and/or notification. Reports - Most reports will have an option to send a report using the NDDS. At the time of this document (December 2017). The fees are as follows. 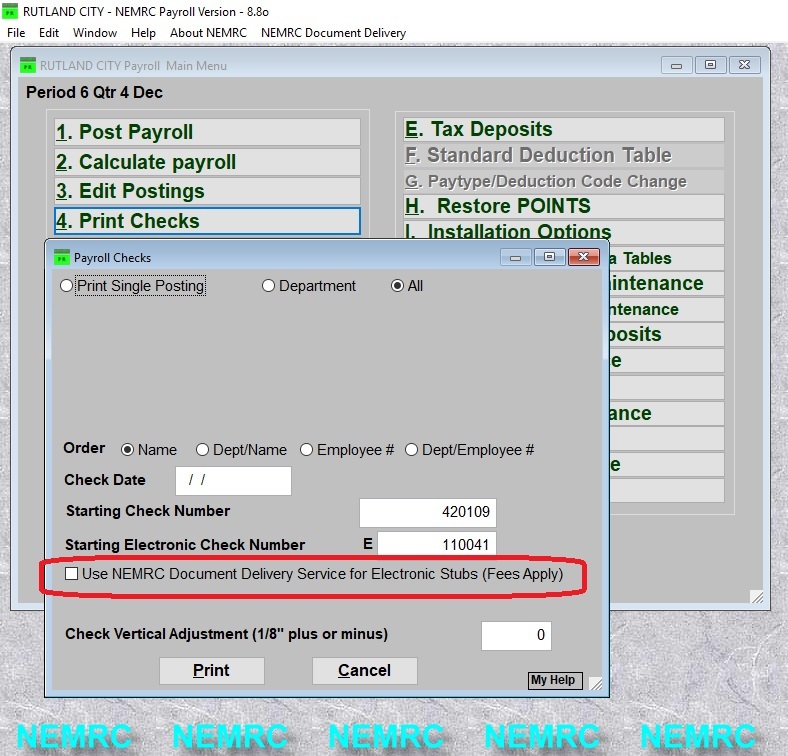 When printing utility bills or checks an option will appear in the screen to use the NDDS for paperless delivery. If selected, PDF versions of the document are created and staged for dispatch to the NDDS. When complete you will prompted to visit the NDDS dispatch screen where you can review the fees and dispatch the items to NEMRC for delivery. Items dispatched will typically be received within an hour. Most Reports after clicking the "Print Button"
Do I get charged for a notification and a paperless billing if I choose both? Email is free. While it is true sending an email is free, the infrastructure required to manage the sending and receiving of multiple emails with minimal added workload and local information technology expertise is not. NEMRC's NDDS server was created specifically for this purpose. NEMRC has added human resources needs to manage this system. Simply start in payroll and utility bills by filling in the email fields in maintenance and choose paperless delivery or notifications when printing and choose to use the NDDS. Should I consider with paperless billing agreement? Yes! so that a client is fully aware that failures to pay a paperless bill will result in delinquency. Does NEMRC have a generic paperless agreement? What happens when an item(s) is not deliverable? NEMRC will inform you if an item is not deliverable so changes can be made in your system. What happens when a user clicks reply? NEMRC has programmed your "reply to" address in the emails so reply's will be sent to you. What happens if a user does not receive the email? You should request that the user add ndds_do_not_reply@nemrc.com to their email "white list" or check their SPAM box. What happens if I want to stop paperless delivery after dispatch? It is critical that you call with urgency 800-387-1110 and tell support you want to stop paperless delivery of items you dispatched. This typically must be done within 30 minutes or less. Are my items automatically dispatched? No, you decide when to dispatch the items. Can I view the items before I dispatch them? Yes, in the NDDS dispatch screen you can view batches. Can I test the NDDS? Yes, by adding only a few test paperless deliveries you will be able to view how this works. Will there be a place clients can pay a bill? At this time No, NEMRC is reevaluating with the introduction of the NDDS service as paperless billing and payments go hand in hand. If you have your own payment system it may be possible to integrate that into the email.